We are looking for a candidate who is legally authorized to work in the US, to fill the Microsoft Dynamics AX Retail Senior Consultant USA position. 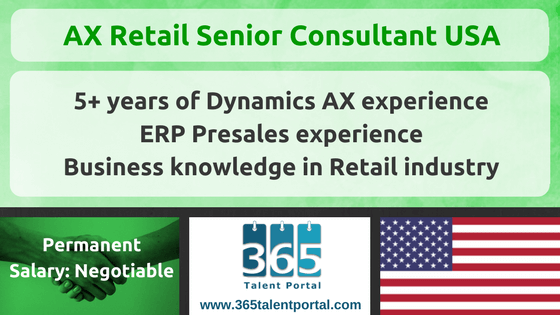 As a Senior Dynamics D365 / AX Retail Senior Consultant, you will design, implement and support Dynamics AX / D365 for Finance and Operations ERP system. You will have the ability to understand requirements, evaluate alternative solutions, resolve issues, communicate project status and document system changes. .